Chocolate and orange work so well together and this sweet bread is no exception. 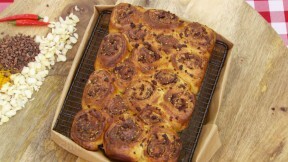 This chocolate orange swirl bread recipe is featured in Season 4, Episode 3. For the dough, in the bowl of a freestanding mixer cream the butter, sugar, orange zest, cardamom and salt until pale and fluffy. Mix the milk and yoghurt together, then warm until it reaches body temperature or 98.7F if using a food thermometer. In a separate bowl, mix the flour with the yeast. Slowly mix the milk mixture into the butter mixture. If it curdles, add a little of the flour mixture, then go back to adding the milk. Change the attachment on the mixer to a dough hook, then tip the flour on top of the wet ingredients and knead on a low speed until combined. Increase the speed to medium and knead for 10 minutes. Transfer the dough to a large greased bowl and cover with cling film. Leave to prove in a warm place for 45 minutes. For the filling, in a food processor combine the chocolate, both kinds of almonds, cocoa powder, chilli and spices. Pulse until it forms the consistency of breadcrumbs. Grease a 12x8x2½in baking tray and line with greased baking parchment. Flour the work surface and tip the dough out onto it. Cut away a third of the dough and set aside. Stretch the remaining dough into a rectangle approximately 16x8in. Cover the dough with two-thirds of the filling mixture, leaving a ½in gap at the long edge closest to you. Tightly roll up the dough starting with the long edge which is farthest away from you. Use the ½in strip (that is not covered with filling) to seal the join. Cut the roll into twelve 1¼in-thick slices and place on the prepared tray. Stretch out the remaining dough into a 4x12in rectangle. Cover with the remaining filling, leaving a ½in gap at the long edge closest to you. Cut into six 1½in thick slices and use them to fill the gaps between the larger rolls. Place in a warm place to prove for a further 20 minutes. To finish, brush the top of the buns with beaten egg and sprinkle with cocoa nibs. Bake in the middle of the oven for 30-40 minutes. Remove from the baking tray and set aside to cool on a wire rack. For this recipe you will need a freestanding mixer with a dough hook, a food thermometer, a food processor and a 12x8x2½in baking tray. Note: This recipe contains U.K. measurements and may require conversions to U.S. measurements. It has also not been professionally tested.